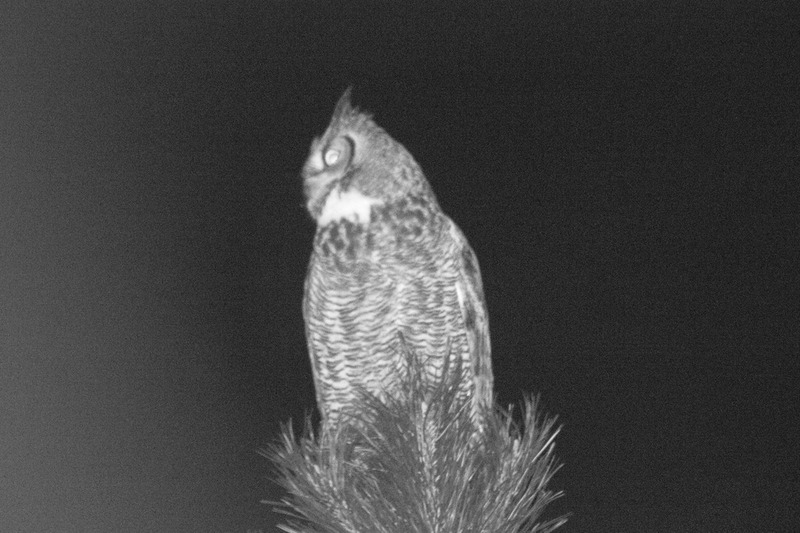 There’s an owl that comes to visit occasionally. He sits at the very top of the tree right outside our window and hoots. It’s fascinating, and we’ve started calling him “our owl”. The last time he came to visit, I tried to get some pictures. As you can see, I didn’t have the best luck getting a good photo; but you can decide which final shot was better: the grainy or the blurry one? This entry was posted in Fotografie, Photography and tagged animals, birds, Fotografie, owl, photography, wildlife on 20190130 by matt. RAWTherapee scheint die hoche Filmempfindlichkeitseinstellung-Körnigkeit zu verschlimmern. Wann ich beide Fotos gesehen hat, mir hat auch das zweite mehr gefiel. Manchmal schwarz und weiß versteckt Fehler… Aber nicht dieses Mal. Ich denke nächste Mal, ich die Anwesenheit der Uhl nur würdigen werde. Keine Versuche Fotos zu machen. Doesn’t seem so blurry, but I like the detail and color of the “blurry” one. When I first saw the finished color version, I wasn’t impressed; but I wasn’t expecting the BW version to be so grainy. I really couldn’t decide which was better since I was unhappy with elements of both. The consensus (all two of you) is the color one’s better.